It is the way of this digital world that major publishers now attach software nobody wants to their very best games. For every Battlefield, an EA Origin; for every Half-Life 2, an early Steam; for every Far Cry 3, a Uplay. Only Uplay’s proving particularly difficult today – Ubisoft’s servers are down and players have been welcomed to their tropical sandbox with half-loaded menus and missing saves as a result. It seems that although Far Cry 3 is primarily a singleplayer, Uplay runs in the background and sees even that goes doolally when its servers are down. Hear the whole, sorry tale first-hand from RPS’ John Walker, who’s doing a terrible job of having a day off. Luckily there’s an easy workaround for now – put Uplay in Offline mode. 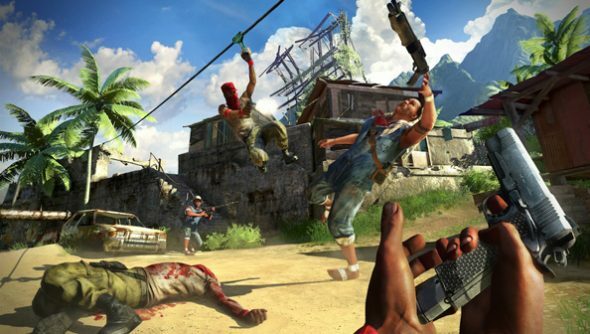 “We’re very sorry for the server issues affecting Far Cry 3 on PC and are working as fast as possible to restore the service,” said Ubisoft on Twitter. That’s good news. Because in the words of Zach Galifianakis in middling-to-good contemporary political comedy The Campaign: It’s a mess. What’s more, Far Cry 3 still isn’t available in the UK Steam Store. It seems conspiring fates are doing their level best to stop us enjoying the year’s best PC shooter. Have you had trouble getting the thing to work today?